Clay Cooper’s Country Express is all-new for the 2018 season and there is so much variety in this show. There are many incredible songs featured in this show and the lineup of cast members is amazing! They sing, dance, trick-rope, and will even make you laugh! Clay Cooper is the star of the show and it is easy to see why he has been voted “Entertainer of the Year” numerous times. He charms the audience with his witty comedy, Southern accent, and country voice. Clay performs classic country songs throughout the show that everyone will want to sing along with. Tina Cooper, Clay’s wife, choreographs all of the dance routines and also sings multiple numbers during the show. Matt Gumm is the comedian of the show and has been performing in this show since it opened. Besides making people laugh, he is also featured on numerous songs throughout the night. Matt portrays Jerry Lee Lewis, Julio Iglesias, Willie Nelson, and many more. On top of this, he can also play every instrument on stage. Kari Garrison is also extremely talented. She is a featured female vocalist and wows the audience all night long with her beautiful voice. From Little Big Town to Country and Gospel, Kari can sing it all! Third Power is a brand new trio featuring three talented gentlemen! Their rendition of “Bridge Over Troubled Water” is stunning. They are also featured in an NSYNC number and many other songs throughout the show. On top of the amazing vocalists, the show features very talented dancers and band members. 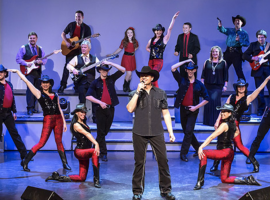 There are over 24 performers in this show and audience members will see why this is a top-rated show in Branson. The show opens to “This is the Greatest Show,” from “The Greatest Showman.” The cast puts their own twist on this song and it is phenomenal. Numerous country songs are featured during this half before ending with a Gospel segment featuring the entire cast. During intermission, many cast members come out to visit with the audience and take pictures! During the second half all of the performers get to showcase their talents again. There is more variety in this portion and audience members will hear songs from: the Jackson 5, Jerry Lee Lewis, The Judds, ZZ Top, and more! The show ends with a special tribute to all of the Veterans and a moment to honor America. Guests will not want to miss Clay Cooper's Country Express this year!